Synopsis: A family drama about a son’s unconditional love for his father despite his father’s alcoholism and gambling addiction. Did You Know? Wallace Beery “tied” Fredric March (Dr. Jekyll and Mr. Hyde) for Best Actor. Beery actually received one less vote than March, but due to Academy regulations at the time, any result within one or two votes was considered a tie. This marks the first of two ties for an acting award at the Oscars. The Champ makes me very sad. Poor little Dink (Jackie Cooper) sees his father through a veil of veneration, and no amount of abuse (alcohol, gambling, domestic) can tear through it. He believes that his father means well, despite his constant empty promises. Dink looks after his father more than his father looks after him. 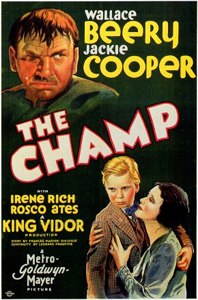 What makes it even more sad is that the film’s intention is for us to root for Champ. We’re supposed to want Dink to choose Champ, but my heart breaks when he does. But from Dink’s perspective, how could he possibly choose his mother: in his eyes, she abandoned him; even though he’s a selfish addict, his father has always been there for him. But poor Dink is forced to choose his mother after he watches Champ die of a heart attack in one of the most gut-wrenching, tear-jerking, heart-rending scenes in cinema. Wallace Beery and Jackie Cooper are both sublime.